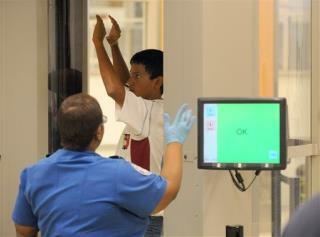 (Newser) – A single sentence in a seven-page "Privacy Impact Assessment Update" published Friday by the Department of Homeland Security has wiped away the ability to have the absolute right to opt out of passing through an airport body scanner. The key line: "While passengers may generally decline [Advanced Imaging Technology] screening in favor of physical screening, TSA may direct mandatory AIT screening for some passengers." As a TSA rep tells Time, you can still make the request to opt out, but "some passengers will still be required to undergo AIT screenings as warranted by security considerations in order to safeguard transportation security." The update gives no specifics regarding what would warrant such a forced screening. No matter how they start out, all forms of government eventually degrade into tyranny. The human animal is infected with a lust for power. Funny I quit flying after all this search and scanning. I think I haven't flown now in almost 4 years. Really don't miss them cramped cabins and seats that seem to be always getting smaller. but he points out the likelihood of a "few headaches" TSA screening is just preparing people for the huge roll out of the Police State. Checkpoints randomly placed in malls and stores. Scanners at schools, hospitals and other public places like theaters and malls. People randomly selected off the street to check their "REAL ID" also known as their papers. Its so sad to see. Breaks my heart.